There is psychological and neurobiological evidence that number and language processing present some specificities and may dissociate after brain damage. Furthermore, animals and babies seem to be able to discriminate small numerosities in a non-symbolic way. However, one of the specificities of the human species is the development of language and symbolic processes. The acquisition and development of arithmetic is thus bound to the acquisition of language and symbolic notations. 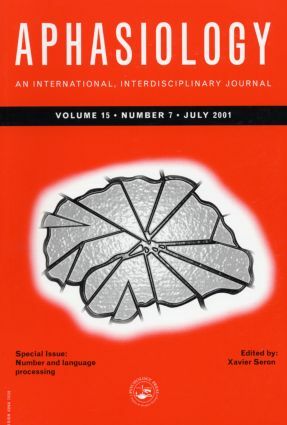 In this special issue, the relationship between language and number processing is discussed through the examination of the similarities and divergences of language and number disorders in aphasic subjects, in patients with dementia, and in children with specific acquisition deficits. A separate contribution is also devoted to the rehabilitation of number and calculation deficits in brain-lesioned subjects. X. Seron, Number and Language Processing: Introduction to Special Issue. M. Delazer, L. Bartha, Transcoding and Calculation in Aphasia. D.C. Geary, M.K. Hoard, Numerical and Arithmetical Deficits in Learning Disabled Children: Relation to Dyscalculia and Dyslexia. L. Girelli, M. Delazer, Numerical Abilities in Dementia. L. Girelli, X. Seron, Rehabilitation of Number Processing and Calculation Skills.